In a highly unusual move, the company outlined Labour's policy in stock market documents. The filing said "future intervention" by the government could affect the company's ability to meet obligations. Labour argues that taking water into public ownership would end "rip-off" prices and excessive dividends. How could Labour's plans for greater public ownership work? The shape of water: should the industry be renationalised? In a document to the Irish Stock Exchange, Thames Water highlighted Labour's policy of renationalising the UK water industry, along with others such as gas, electricity and the railways. Business correspondent Rob Young said: "It's unusual for individual companies to be so explicit in public about the potential impact of one political party's policy." 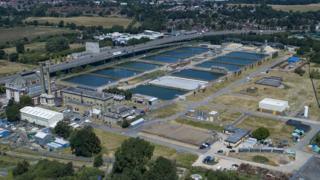 "The prospectus from Thames Water says investors will be able to demand their money back quickly, if a majority of the firm is taken over by the state." Mr McDonnell told Labour's party conference in September the water industry would be the first to be renationalised. Under Labour's plans, ownership of the existing water and sewerage companies would be transferred to new Regional Water Authorities. Water was one of the last of Margaret Thatcher's major privatisations, with 10 large regional authorities - of which Thames Water was the largest - sold off in 1989. The Conservatives have said Labour's nationalisation plans would result in "a collapse in business investment and a crash in the value of the pound".